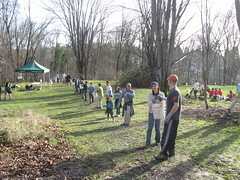 Volunteers in a mulch bucket brigade at the Cheasty Greenspace MLK Day work party last year. Photo courtesy of EarthCorps. It may be winter, but volunteer activities in Beacon Hill’s parks are ongoing. Even in this off season inclement winter weather, work is going on in little Lewis Park. Crews have been busy removing the invasive laurel and ivy plants and putting in ground cover to prevent erosion in the ravines. Further, a crew has been working with the foundation for the eventual kiosk along 15th Avenue South at the 14th Street “Y.” To be completed by mid-January. More ground cover/compost material will be spread on the upper south area of the park on MLK day, January 17th. There is still much work to be done in the lower east side of the park, with further removal of invasive plants, but planting of native plant species will begin in early spring, when we will look forward to more people in our neighborhood, and groups will volunteer to help with this worthwhile renewal project that will make Lewis Park the jewel entrance to Beacon Hill from the city. Nearby at Dr. Jose Rizal Park, and further south at the Cheasty Greenspace and Dearborn Park, EarthCorps is organizing MLK Weekend of Service work parties. Last year, 266 volunteers showed up to help improve the Cheasty Greenspace—see them here. This year’s event starts at at Dr. Jose Rizal Park on Saturday, January 15, from 10:00 am to 2:00 pm. Volunteers will continue work to reclaim the forest area of the park, including mulching, planting trees and other native species, and doing trail maintenance. You can sign up to participate here. On Sunday, January 16, volunteers will move to Dearborn Park from 10:00 to 2:00. Sign up here. Then on Monday, January 17, the work party moves to Cheasty Greenspace from 9:30 am to 2:00 pm. Sign up for the Cheasty volunteer party here. On January 22, Saturday, 10:30 – 12:30 am, City Fruit will conduct a training class for volunteers working on the orchard projects it has selected as part of a city-wide program. It will be held at the Jefferson Community Center, and is open to all who wish to volunteer on these projects. The orchard at Dr. Jose Rizal Park was selected as a model, sustainable, organic orchard for Seattle. The fruit tree steward workshop will address basic tree biology (why are roots so important? ), orchard management month by month, and basic orchard safety (how not to fall off a ladder). Our instructor is Ingela Wanerstrand, owner of Green Darner Garden Design. She specializes in edibles, has been working with fruit trees for more than 15 years, is an active Friend of Piper’s Orchard in Carkeek Park, and is a wonderful teacher. Come February 19, City Fruit will hold a pruning workshop for stewards in the orchard at Dr. Jose Rizal Park. Significant work has been done in the orchard area over the last six months, including brush removal, initial pruning, typing, and even a small harvest of winesaps. A gate has been put in at the southeast corner of the off-leash area fence, just off the access trail. With the Mountains to Sound Greenway project going through the park this year, the OLA will be reconfigured, so more forest will be added to the woods, and the orchard will become a separate feature for the park. Just a note on the Dearborn Park project. In many ways, this is the model project for forestry work for all of Beacon Hill, including the work at Dr. Jose Rizal and Lewis Parks, and the Cheasty greenbelt and the Maple School Ravine. If you want to see what the end product of any of these other projects could look like, check out Dearborn. It’s not only a successful restoration project, but it is an education project that incorporates kids, parents, and people from the neighborhood, including the Chinese Baptist church across the street. The walking trail through the woods is highlighted by informational signs, and it features hands-on and heads-on exploring for visitors of all ages. Simply one of the best natural spots on Beacon Hill. I only discovered Dearborn Park this fall when my son’s soccer games were there. Its a great park with a great woods. I haven’t checked out the trails yet, but expect to when it dries out. Dearborn Park Elementary is easy to find from the Chief Sealth Trail if you ride your bike, finding the park takes a little more effort – check out a satellite image if you are planning on visiting!